Do you remember shopping at Lowell’s Giant Store? For decades, the Giant Store promised ‘giant savings’ and helped form the core of Downtown Lowell’s department store heyday that included other iconic shops like the Bon Marché, Pollards, and Cherry & Webb. 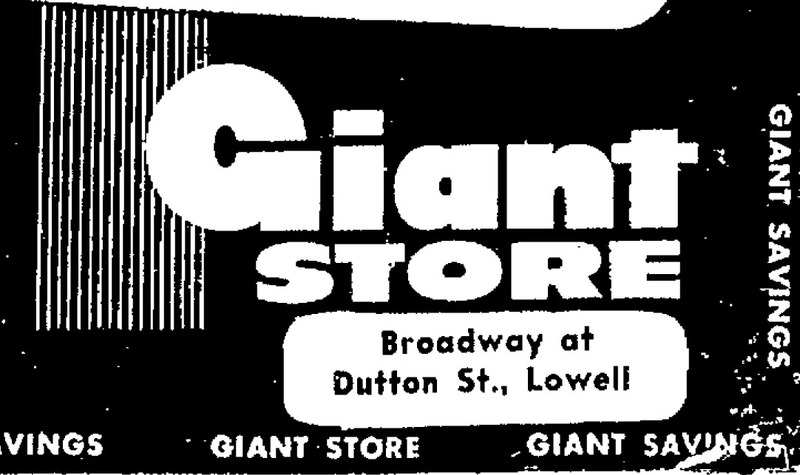 The Giant Store sat on the edge of Downtown Lowell, at the corner of Dutton and Broadway, and offered the latest in just about everything, at discount prices. The Giant Store’s five floors offered electronics, clothing, food, paint, sporting equipment, and more. 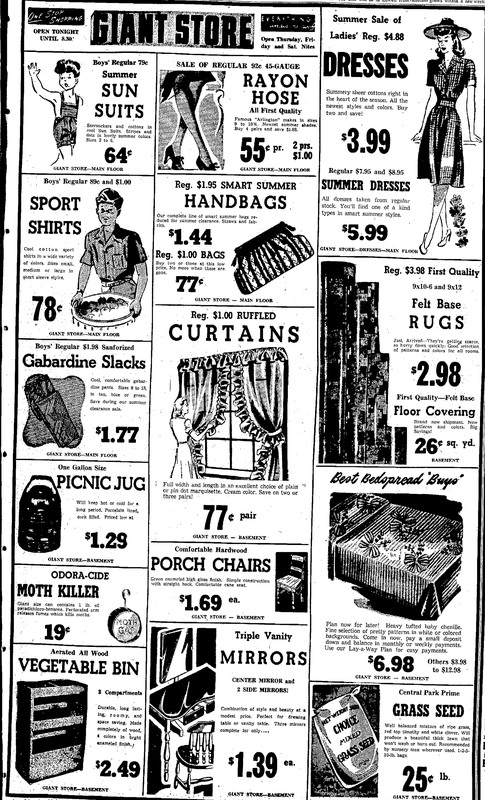 if you needed spray paint, wallpaper, curtains, rugs, transistor radios, or even moth killer, chances were you would find it on one of the Giant Store’s four upper floors. And, in the basement-level garden shop, you could pick up fertilizer spreaders, bird baths, trellises, or grass seed at prices that seem quaint by today’s standards. 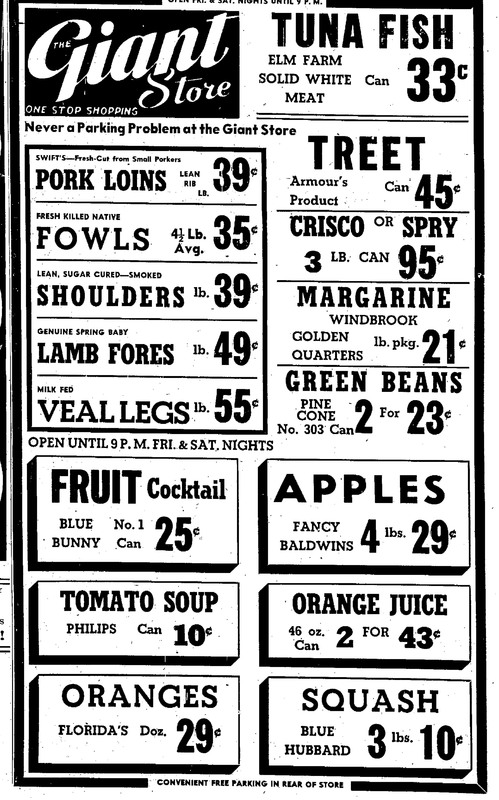 The Giant Store ran frequent ads in the local papers, but seldom made news itself – with the notable exception of a November 26, 1951 robbery where two men stole so much cash from the Giant Store that it could have bought and furnished a fairly comfortable home. 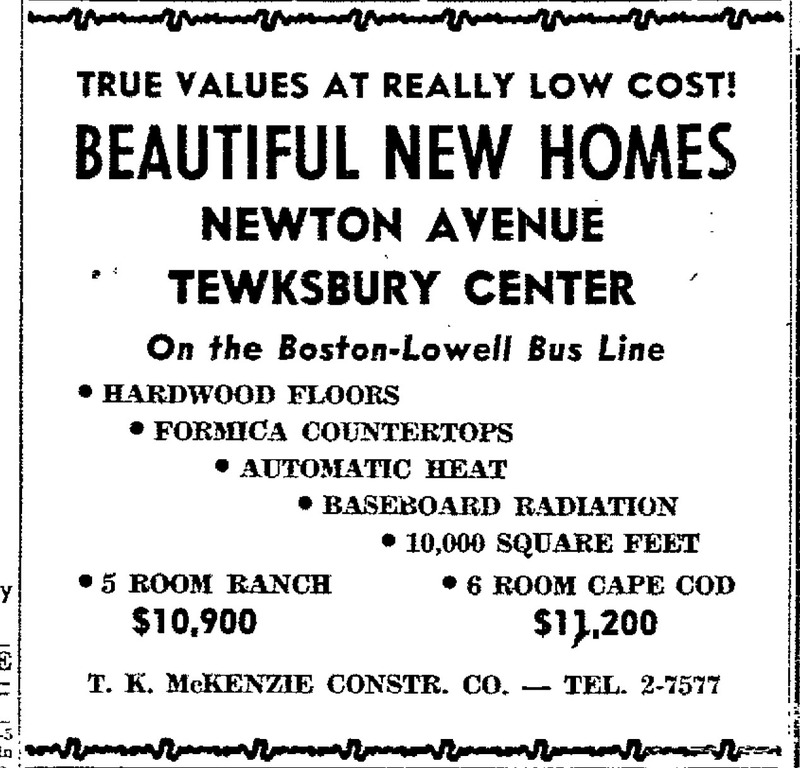 At the time of the robbery, in the early 1950s, an enterprising young couple could buy “a beautiful new home” on nearby Tewksbury Center’s Newton Avenue for just $10,900. That five-room ranch would have boasted the latest in suburban accommodations: hardwood floors, automatic heat, baseboard radiation, and even formica countertops. And, if you added just $300 more, you could have upgraded to a six-room Cape Cod style house. But, where could you get that kind of money? In the early fifties, the average US family brought home some $3,900 annually. That meant that that family would have had to spend nearly three years’ salary buying that home in Tewksbury. If you did your research, though, you could find a faster way to gather enough money to buy that house. It was not such a well-kept secret that the Giant Store regularly sent two stock-boys to the nearby Wamesit branch of the Union National Bank with the store’s cash receipts. It was also no secret that those cash receipts would be even bigger after a weekend of post-Thanksgiving Day shopping. So, if you were to pick the Monday after Thanksgiving weekend in 1951 to stage your hold-up, you would have gotten away with $20,000 in cash. Today, that would be worth the equivalent of $183,000. That would have bought a house, maybe even two, in 1951. And, that’s precisely what happened, on November 26, 1951. When news of the robbery hit local headlines, the Lowell Sun called it “one of the most fantastic and incredibly easy stick-ups in Lowell history”. Local police raced in quickly and confidently in the minutes afterward, and even identified some clues. Lowell police teamed up with Massachusetts state police and questioned the likely suspects – parolees and ‘known hoodlums’. They also searched local rooming houses for bad apples who might have perpetrated the attack, or at least knew something about it. Police even set up roadblocks in the hours after the robbery, which later was expanded to include a search of 13 states.Local investigators always felt it was a local job, though, organized by someone who knew the Giant Store and its operations. The two stock-boys were both Lowell residents and students at Lowell High School. At 2 PM, cars were parked bumper to bumper on a deserted Dutton Street. The two gunmen emerged from between the cars and told the stock-boys to ‘hand over the money’. One man approached from the front, brandishing a gun. The other came from the rear. They both eyed the canvas bags carried by the two stock-boys, each clearly stamped with Union National Bank’s name. Once the stock-boys handed over the two unsealed canvas bags, full of fresh cash, the gunmen instructed them to “turn around and walk back the way you came.” The stock-boys did just that, and walked about 100 feet, when they heard the getaway car race away. From a 1936 city atlas, the location of the Giant Store is marked with a large black arrow. The smaller black arrow marks the location of the Wamesit branch of the Union National Bank. As the car sped off, the stock-boys ran back to the Giant Store, and shouted the alarm to a ‘girl office clerk,’ who called the police. Police got descriptions of the robbers: the man in the front had held a small automatic pistol, and appeared to be between 45 and 50 years old. The stock-boys remembered that he stood about 5 feet 10 inches tall and had gray hair and a medium build. They also remembered that he was clean-shaven and spoke ‘good English’. They never saw the guy behind them. More clues started to emerge in the first days after the robbery. A car, belonging to a Dracut man, had been reported stolen from a parking space off Thorndike Street. It was later found on Moody, abandoned. Another man claimed he had been cut off by a maroon sedan, near the Giant Store, around the time of the robbery. The case made the TV news. On December 1, the holdup was featured on the “Public Prosecutor” show on WBZ-TV. Police soon deduced that the robbers knew what they were doing, striking on a Monday when weekend cash receipts would be brought to the bank. Police interviewed sales staff and executives to determine if there were disgruntled former employees, suspicious loiterers, or anyone they could focus their attention on. Police looked into the robbery for weeks, and eventually exhausted all leads. One clue, and then another withered and died. It turned out that the maroon sedan had nothing to do with the robbery. And the fingerprints found in the stolen car led to nothing. Police eventually resorted to hoping a phoned-in clue might lead to arrests. But, those never came, and the case remained unsolved, and does to this day. Later robberies were compared to the Giant Store heist in the years following, but eventually, the case faded from the headlines. Drive down Lowell’s Dutton Street today and you can’t miss the building that was once the Giant Store. It forms a five-story wall that lines one of the main roads leading out of Lowell’s downtown and into its Acre neighborhood. Today, it houses the 305 Dutton Street Lofts. 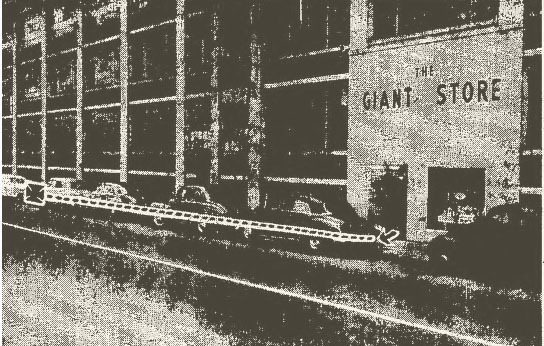 The Giant Store was founded by Ben Swig and incorporated in 1933. By 1934, though, the Giant Store building was already a local landmark. The building known today as the Giant Store actually came into existence when it was built for the Saco-Lowell Shops, in the years following the first World War. The Saco-Lowell shops added the Giant Store building to its complex around 1920 and called it the rather plainly named Building #15. The Saco-Lowell shops had been around, at the point, for about a century, dating back to 1824, when the Merrimack Manufacturing Company formed the company to make mill machinery to support Lowell’s growing mill industry. By the late 1920’s, the Lowell Machine Shop was closed and its large collection of buildings were being demolished, except for #15. The Giant Store moved in around 1933, and lasted nearly forty years. 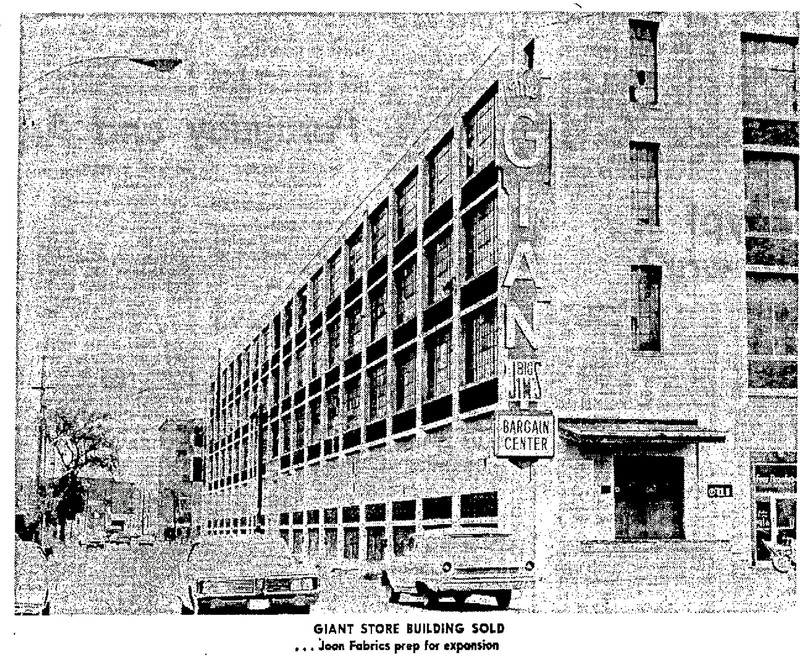 By 1972, though, the Giant Store found itself on the brink of bankruptcy. 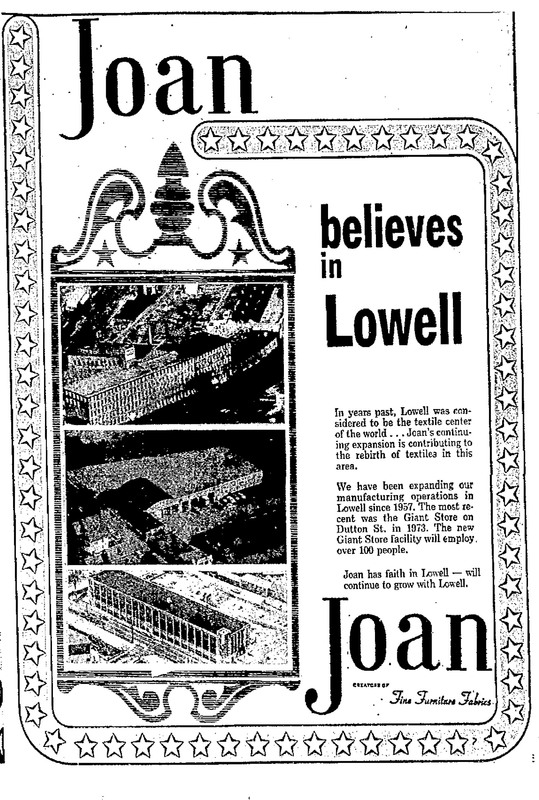 The Lowell store was gone by the next year, when Joan Fabrics moved into its Dutton Street site. The Lowell community welcomed the new Joan Fabrics facility which promised to employ over 100 people. At the time of the sale, four other tenants were at the Dutton Street location including Big Jim’s Department Store, WLLH radio, and Offices Unlimited, Inc. Around the same time, also in 1973, as the Giant Store worked through its bankruptcy proceedings, the King’s Department Store chain bought the Giant Store’s 425,000 square foot warehouse in Chelmsford at 9 Stuart Road. Fascinating! Have you written about Spag’s yet? Another central Massachusetts institution that is no more..
Great story. What I also find interesting is there used to be on-street metered parking on Dutton St. Made so much more sense for economic development and walkability than the 4-5 lane highway there now. I grew up in the Acre section of Lowell on School Street in the 1950’s and early 60’s. I remember going with my Mom and Dad to do our weekly shopping for groceries and other household goods at the Giant Store. I recall climbing the stairways to get to the different floors and departments within the store. You could find just about anything in that store from groceries to hardware to clothes and even toys. It was always fun walking around the store with my parents because there was “so much neat stuff” to see as a kid. I no longer live in Lowell but when I am in Lowell going down Dutton Street, I always think of those days my parents shopped at the Giant Store. It was an outing once a month to go to Giant. Mom and Dads friends had a truck and we would all pile in the back for a trip to grocery shop. This was in the late 40’s.